On one hand, living near the sea has a host of obvious advantages. You can walk to the beach, soak in unparalleled ocean views from your balcony, or maybe even take up a coastal hobby like boating or surfing. On the other hand, your house could flood or be demolished entirely by nature. Hurricanes, tidal waves, and tropical storms have long made living by the beach almost as risky as it is pleasurable. But with global warming and the long documented trend of rising sea levels, there’s a new risk for owning a home by the sea: your plot of land will simply become part of the seascape and never be habitable again. With some of the most populated and desirable locations in America located near the sea, just how many people will be displaced when the sea levels rise? We decided to analyze how many people in America live near the sea to see where devastation from rising sea levels will be the greatest. We started with the United States Census data on coastal tracts of land, and calculated which of these zones were most populated in areas likely to be vulnerable to rising sea levels. We also looked at how much homes cost in these zones and how much home insurance premiums cost. The state with the most people living in coastal zones susceptible to rising sea levels is Florida, where almost 1.8 million people live near the water. The US cities most at risk to global flooding are New York, Seattle and San Francisco, the nerve centers of the financial and technology industries. However, the two areas with the most expensive properties that are at risk to rising sea levels are both in Connecticut: Riverside and Darien are both high risk zones where the median home costs almost $2 million. Lastly, though homeowners insurance does not typically cover flooding, comparable home owners insurance is much more expensive closer to the sea, especially in Texas. 23 of the 50 states in America have some level of their population living in coastal zones. Florida, however, has by far the most people living in areas that could flood with rising sea levels. Since the state is a peninsula surrounded by the Atlantic Ocean and the Gulf of Mexico, much of the development is near the beaches. 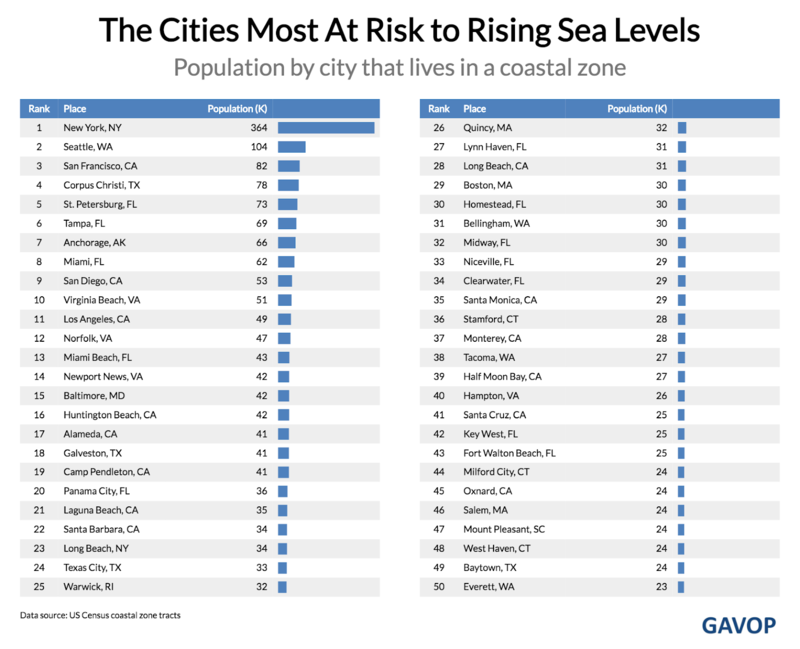 California and Washington, both of which abutt the Pacific ocean rank as the places with the second and third most people at risk to rising sea levels. The map above highlights the challenging geographies of these places with high population levels living in coastal zones. Diving deeper into the data, which cities are most populated in places where the sea levels may someday rise? New York City, a place completely surrounded by water has 346K people living near the coast. 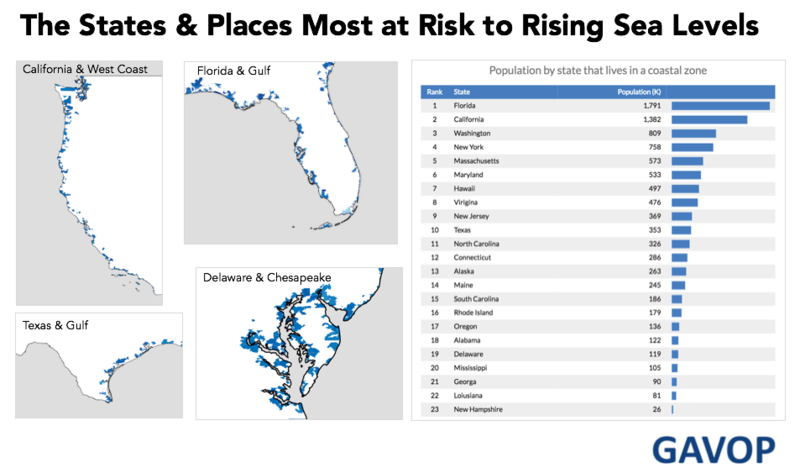 Some of the most notable cities in America will be hugely impacted by global warming if projections of higher sea levels hold true: Seattle, San Francisco, St. Petersburg, Miami, and San Diego all make the top ten list of flood-risk cities. From the prior list, one can’t help but notice that many of these places that are vulnerable to elevated sea levels are also desirable places to live and as a result have expensive real estate. To investigate further, we next looked at which places in coastal zones had the most expensive median home prices. 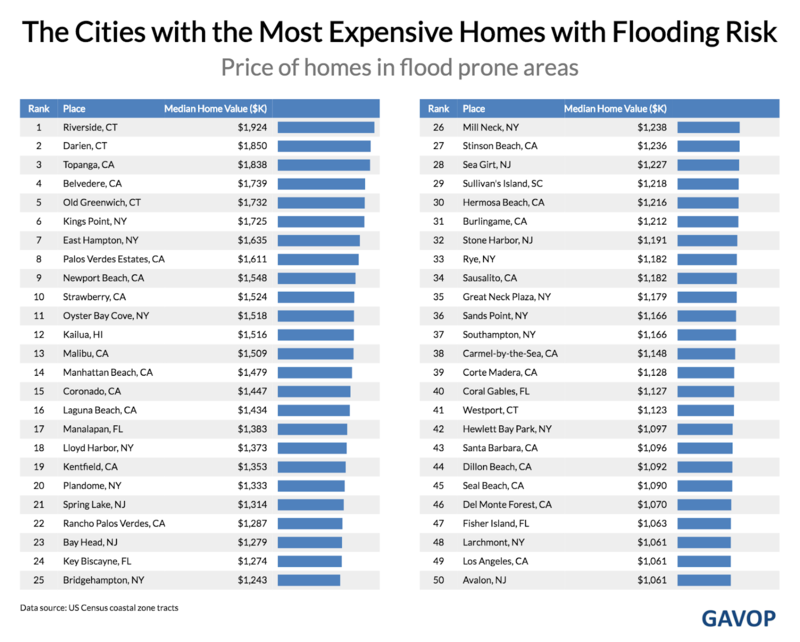 Riverside, Connecticut (a section of the town Greenwich and near New York City) has the most expensive homes in America that are at risk to flooding. The case of Riverside illustrates a common phenomenon that takes places when governments try to regulate building in flood zones: the residents fight back against the added cost. Even with some of the most expensive homes in the world at risk, residents of Riverside and Old Greenwich have fought against new zoning laws requiring homes to become compliant with best practices like raising the homes above levels of flooding. Many of the most expensive suburbs of California, New York and Los Angeles have homes at risk to rising sea levels. For many years, people have paid a premium to live in such beautiful locations like Malibu or East Hampton, but with global warming the homes are now face an ever present risk of flooding. We decided to investigate further to see if the insurance markets are somehow pricing for the risk of rising sea levels. It’s important to note that homeowners insurance does not cover flooding (that’s a different policy typically sold through the government). Nevertheless, are homes near the coast riskier from the insurance companies perspective? 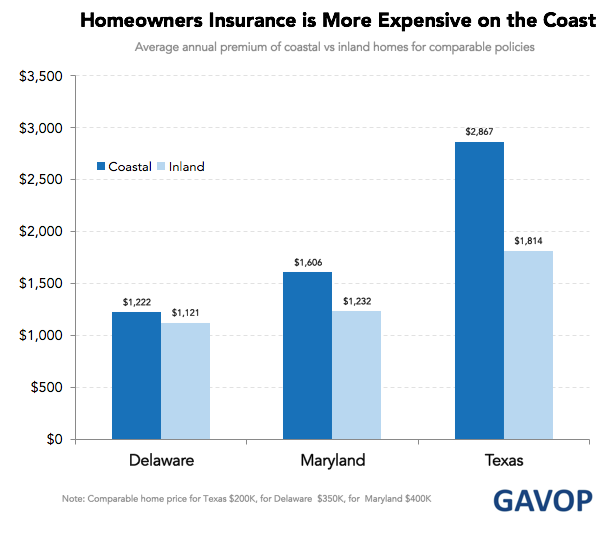 The chart below shows the annual homeowners insurance premium in Delaware, Maryland and Texas for homes that are inland versus on the coast. 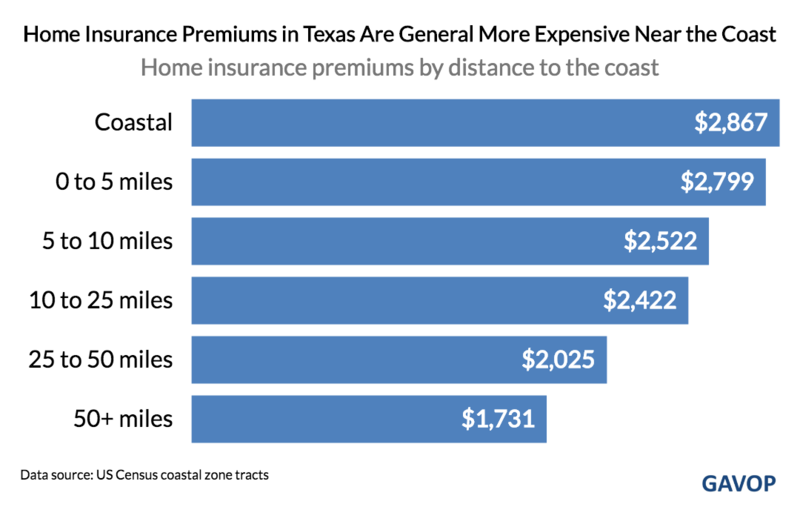 In each of the states, but particularly Texas, the home owners insurance policies are more than twice as expensive on the coast than inland. Because there was such a discrepancy in prices in Texas, we decided to dig further. As a next step, we analyzed at homes that were valued at $200K and looked at their annual homeowners premium depending on how far away from the coast the home was. Even for homes of the same value, the cost to insure the home drops significantly the further you are from the coast. While a home in a coastal zone costs $2,868 to insurance, one that is 50 miles or more away costs just $1,731, a savings of 40%. America’s coastline offers us great opportunities for leisure and enjoyment, but increasingly greater risks. While hurricanes and storms have always posed a threat to coastal cities, those threats are becoming more frequent and severe. Not only that, but in the not so distant future some of the most beautiful (and expensive) real estate in America may be eviscerated by rising sea levels. These rising sea sea levels may affect all Americans in one way or another, but they’ll be felt especially in Florida, California, Washington, and New York, where huge numbers of people live in the shadow of this ever present threat of flooding.